Cutting sugar out of your diet is one strategy to lose weight and feel healthier, but it can be a tough transition. 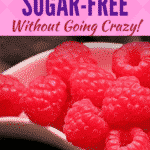 Here are 8 tips to go sugar-free without going crazy! Here’s some more motivation for you to keep going strong on your sugar-free journey. Sugar is highly addictive and can control you. Some studies have shown it to be more addictive than cocaine and nicotine. In fact, if you have a real problem with eating sugar, it might be time for a sugar detox. Prolonged intake of sugar has been linked to mood disorders, obesity, diabetes, and other serious metabolic disorders. It may seem like a struggle to give up sugar at first, but I promise it gets easier. Experiment with these steps and you’re much more likely to beat the sugar blues without going crazy. Here are my favorite ways to go sugar-free without going crazy. One gram of fat contains 9 calories while one gram of sugar contains 4 calories. Fat is more satiating, making you feel more full for a longer period of time. 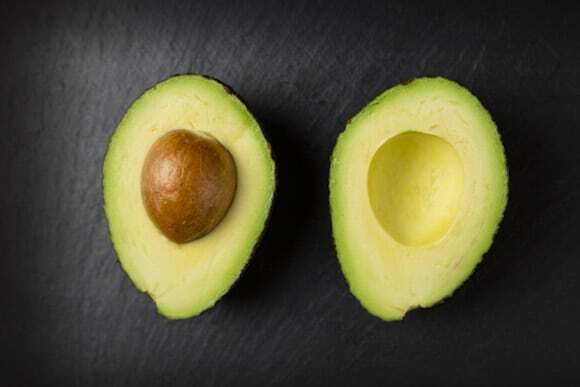 If you eat more fat you’ll generally crave less sweet stuff. Opt for healthy fats like avocados, nuts, seeds, coconut oil, extra virgin olive oil, and fattier fish like salmon, mackerel and sardines. I find that adding more healthy fat sources to my diet definitely decreases my after-meal or snack time cravings for sugary treats. Studies have shown that shorter sleep duration is associated with an elevated body mass index. The reason for this is because your appetite regulating hormones (leptin and ghrelin) are negatively impacted by sleep debt, causing you to crave easy sources of energy that often come from sugar. If you make sleep a priority and aim to get at least 7-9 hours per night your hunger hormones balance out and your cravings for the sweet stuff are reduced. Getting consistent solid sleep is one of my biggest challenges, but it’s gotten so much better using my healthy sleep hacks. I often hear women (and men too) say that they didn’t mean to eat whatever their sweet treat of choice may have been, but stress made them do it. I’ve been there, friend! Emotional eating is common among those who are stressed out, but there are ways to control it. Adopt a meditation practice, go for a walk outside, sip some calming tea, meet up with a friend for yoga, or try some breathing exercises. The 4-7-8 breathing exercise has been known to work well in times of stress. Finding something to take your mind off your sugar cravings is necessary when you’ve been involved in a stressful event and are prone to emotional eating. If you think you have a true sugar addiction, then you might need professional help. See this post about how to beat sugar addiction. 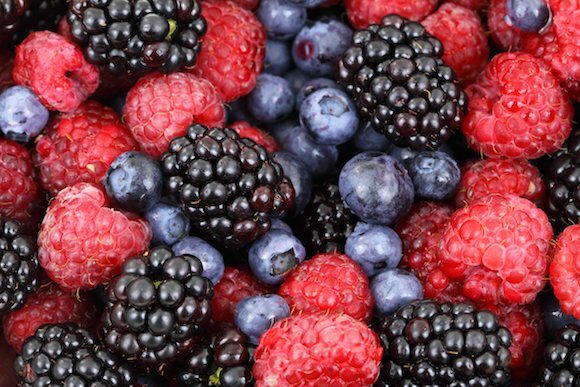 Low glycemic fruits such as berries, green apples, and fruits from the citrus family are good natural options to help you satisfy a sweet craving. These fruits provide a hint of sweetness while also providing you with a fair amount of fiber and beneficial phytonutrients. The fiber fills you up and the phytonutrients provide your body with vitamins and minerals that help you meet nutrient requirements so you don’t try to seek them out somewhere else. If you aren’t a fan of plain water, try adding slices of fruits, cucumbers or mint to your water to make it more pleasing to your palate. I’m also a big fan of sparkling mineral water or naturally flavored carbonated water. Serotonin is also known as the happiness hormone. 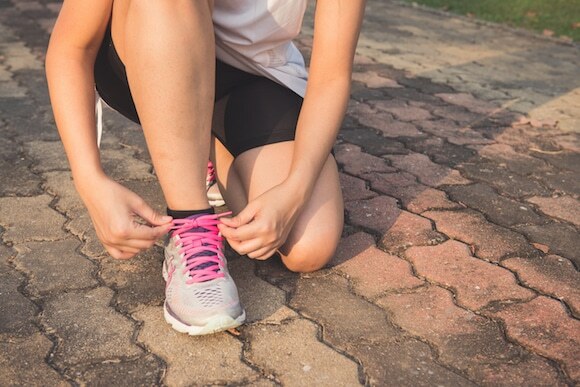 Serotonin levels can be raised through exercise, a nutritious diet and plenty of restorative sleep. People with higher serotonin levels are less likely to crave sweets. There are also supplements that can help boost serotonin levels. I take 5-HTP for just that purpose (be sure to check with your healthcare provider to make sure it’s right for you). There are plenty of sugar-free alternatives available to you, but not all of them are created equally. Aspartame is the sugar substitute generally found in diet drinks. It also goes by the name of NutraSweet and is made in a lab from aspartic acid and phenylalanine dipeptides. There have been concerns about aspartame as a potential carcinogen. Though its carcinogenic effects have not yet been proven, it’s still recommended that you stay away from this stuff. Another sugar-free alternative to stay away from is sucralose, also known as Splenda. A 2017 study found that zero-calorie sweeteners such as aspartame and sucralose were actually found to increase, not decrease, weight. Stevia and monk fruit extract are better alternative choices. Neither stevia nor monk fruit have been shown to be unsafe or have negative side effects, so right now they’re probably the safest options. Some people report that even just a tiny hint of something sweet provokes intense sugar cravings. For these people, it is recommended that they quit all sweet stuff temporarily. This includes fruit and safe zero-calorie sugar alternatives. Read more about doing a sugar detox here. 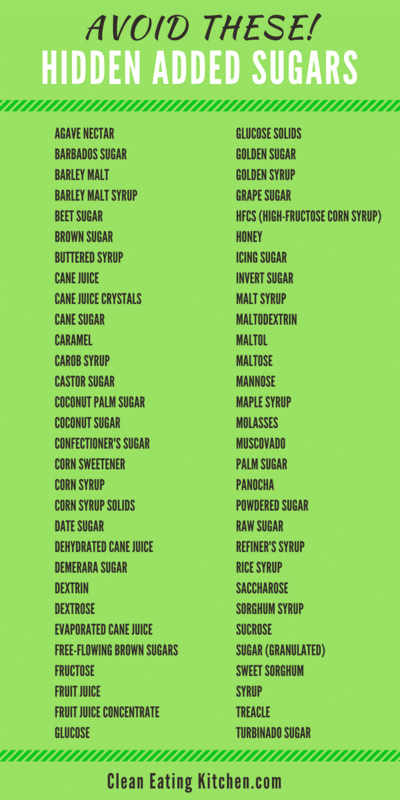 If you fall into this category, as many people with insulin resistance often do, you can add back in sweet alternatives once your taste buds have been reset. This can be anywhere from two weeks to a full year. You’ll just have to know what works for you through intuition and trial and error. Not kidding, going sugar-free wasn’t an option for me most of my life. I used sugar and sweets as my comfort and way of staying sane, so cutting it out would have just added more stress to my life. A lot. In fact, it wasn’t until I got serious about managing my stress and learning how to get in touch with my feelings that I was able to stop using sugar as my coping mechanism. Once this happened, I felt so. much. freedom. I can’t even tell you how freeing it is to eat dessert but because I want to, not because I have to. I know not everyone eats sugar for emotional reasons, some people eat a lot of sugar simply because it tastes so darned good. Our brains and bodies have evolved for us to seek out pleasurable foods. But, the truth remains that many of us go overboard with sugars, especially refined sugars. That’s what it’s not a bad idea to think about going sugar-free or simply cutting back on sugars from your diet. That’s where this post comes in! Lastly, here are some FAQs about going sugar-free. If you have other questions, feel free to leave them in the comment section below. How do I know if sugar is in my food? This can be tricky! Ideally, you are eating mostly real food which wouldn’t have a label. Foods that come in a package often have hidden added sugars. So, some of the ingredients on the package might not sound like sugar, but they are. 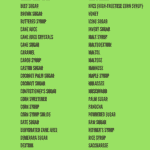 Here’s a list I’ve put together in this infographic about hidden sugars. Do I have to avoid fruit when going sugar-free? I don’t recommend giving up fruit unless you have some health reason for avoiding it. As I mentioned above, fruit is nature’s candy and contains health-promoting micronutrients and fiber. What if I cheat? It’s not a contest and please don’t feel guilty if you have sugar when you don’t intend to. In this case, it might be good to review your reasons for going sugar-free and think about what other choices you could make in the future, especially in a similar situation. What can you eat on a sugar free diet? Just eat real foods! Seriously, you can eat so many foods on a sugar free diet, including fruits, vegetables, whole grains, animal protein, eggs, dairy, nuts, seeds, avocados. Check out this article about a No Sugar Diet. How do you cut sugar out of your diet? It’s up to you whether to cut it out 100% or to take baby steps. Either way, you’ll likely see health benefits from cutting back on sugar. How can I live sugar free? 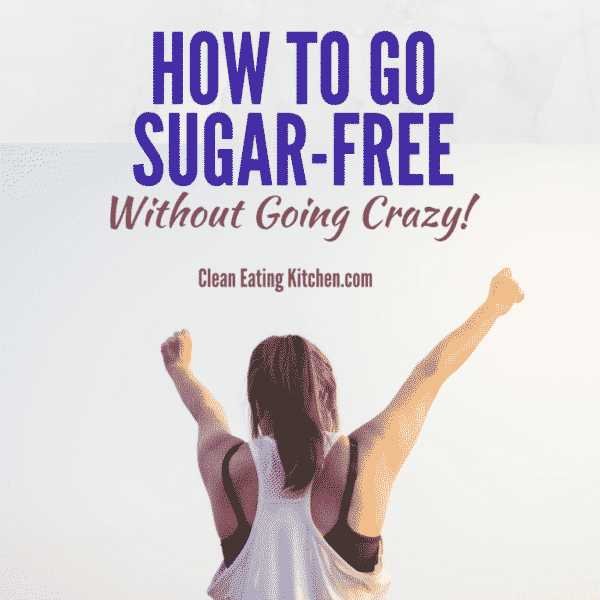 Unless you have a health condition that means you really need to restrict even sugar from whole foods, then there are lots of ways to live sugar free and still not feel deprived. From eating fruit to just adding more whole foods to your diet, it’s actually not that hard to live sugar free. However, if you’re feeling panicked about cutting sugar out of your diet, you might need to consult a therapist who can help you separate emotionally from sugar. If you’re detoxing from sugar, then it’s probably best to avoid fruit just to help your tastebuds reset. So, focus on staying hydrated and eating lots of real, nourishing foods while your body adjusts. 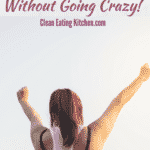 Read more about doing a sugar detox and see all my sugar-free recipes. Now it’s your turn! Tell me about your relationship with sugar, going sugar-free, or challenges you have with sugar. Leave a comment below. Good points here. I am working toward lowering my sugar consumption too. I think #1 works for me as does getting enough sleep. Too little sleep = being tired. Being tired = needing energy. Needing energy = cravings & quick fixes. TOTALLY!!! I heard someone say that women in particular should put sleep as the VERY top priority above dealing with any other health issue, because sleep is so vitally important. Sending love that you get some quality rest, Paula. Very good ideas! I have struggled with refined sugar cravings. I love my sweets, so much that I can’t seem to ditch them at all. Instead of fighting the cravings, I give in and eat “healthier” sweets when I want . There are tons of great recipes (many on this site too!) that use fruits like bananas and dates as a sweetener for cookies, breads, puddings, ice-creams, etc… I think if you have an open mind with a “date sweetened pudding” you will find its a pretty yummy and healthier alternative! Thanks, Erin!!! I have a sweet tooth too, but it’s been so refreshing to not have cravings that drive me crazy. I love dates and bananas for sweetness too! Awwwww, yay! Glad these helped! Great tips! I have been wanting to go sugar free and working towards it, this is great information and something I am saving for when I begin my sugar free journey! I’m happy you found these tips helpful, Noelle! I struggle with this every day. My trick is to drink a warm beverage if I crave sugar. Something about it makes me forget my cake cravings. That is such a great tip, Biana! I love a hot cup of tea after meals. So satisfying! I don’t think I could ever go sugar free but I’m trying to cut back. These tips were very helpful. I never knew that extra fat helps. Thanks for the great tips! I would have a sweet treat, then don’t need more. I crave cheese and potato type foods. I don’t like sweet potato. Is it true to cook potatoes, then refridgerate overnight increase the startch resistance? I need to do that too! Thanks for the nice comment, Suzanne. You can do this!!! I have started to like more ‘naturally sweetened foods’ and think this approach could work for me (but for a while, while I lose the desired amount of weight I need to) it might seem hard to leave-out chocolate, and maybe at times, other ‘semi sugary’ items (eg. blueberry muffins, etc). The thing I need some help with though is ‘creating my own alternative sauces’, as a dietian alerted me to the fact that ‘savoury sauces’ (eg. “Masterfoods”: Tomato Sauce, and BBQ Sauce, as well as some bought ‘relishes’ can also be laden with ‘hidden sugary preservatives, etc). Thanks for sharing that, Tiffany! You might want to search online for Whole30 sauces and dressings, since they are generally free of sugar and made from scratch. my 13 year old daughter and I are trying the no sugar for 30 days. I am overweight, and she is not at all, however she has a big sweet tooth and she is worried about diabetes (runs in the family on my husbands side) It was her idea to start a 30 day challenge after the new year. Like I said I’m overweight so I said I’d do it with her. We haven’t started yet, as I’m looking for the safest way to do this as she is only a teen. I do not wish for her a life full of diets and lost promises to herself. 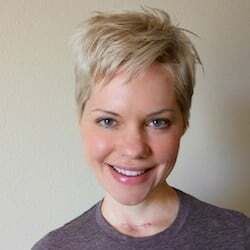 (my life for the last 15 years) She is athletic and beautiful, and I want her to know that health is the most important thing. not body image. So far I’ve been lucky she is not self conscious at all about her body, I just worry that starting a diet like this might give her bad habits in the future (thinking she has to deprive herself to look and feel good) I’m a little torn on this. Any advice would greatly be appreciated. thank you. I chose this particular diet as it seems to be the most sensible especially for a teenager. Great question, Jenn! This is definitely a tricky subject because you want your daughter to have a healthy relationship with food and her body, and not develop a restrictive mindset. I think a lot of what you can do is to set a good example. So, what she hears you saying about your own habits is really important. 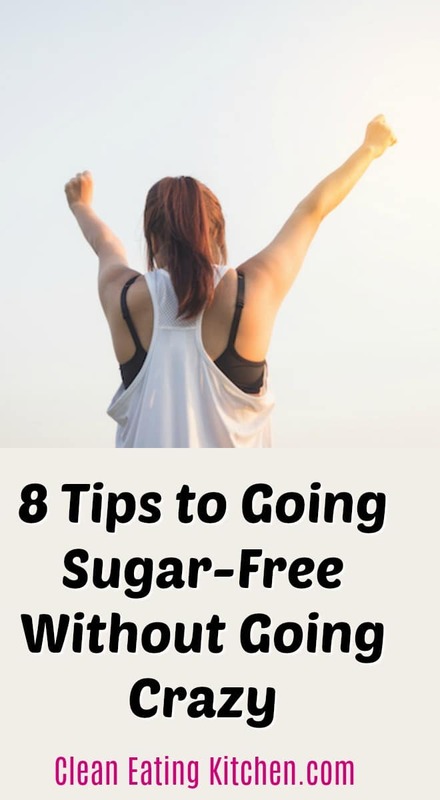 If you say that you want to go sugar-free to reduce inflammation and have more energy, that is a lot different than saying you’re doing it because you want to look a different way. It’s a fine line, but I think if you embrace a loving, abundant mindset about your own body and health, then she will get the message that food choices are about doing what makes you feel good, and not for other reasons that can lead to an overly-restrictive diet mentality. Does that make sense? I don’t have kids, but I recall seeing my mom diet just to be skinny, and that was very harmful to me. I got the message from her that my worth came from my looks and not from what I had to offer the world. I also didn’t learn until later in life that health and beauty takes all different sizes and shapes. After pregnancy I gained a lot of weight. My doctor advised me to reduced it. The level of sugar was in continuous hike. I tried yoga and exercise to minimize the sugar level and it works for me well. I am also going to add some of the tips mentioned by you to m y routine. Hope they will work. Thank you for sharing. Great suggestions! I was a complete sugar addict and no diet/dietary restrictions could fix my problem. My functional medicine doctor put me on organic chromium yeast to help my blood sugar balance and that combined with sleep is the only thing that helps my cravings. Now I can enjoy an occasional dessert or a treat. It completely changes your daily life to the better. I am going to use many of your suggestions to help reduce my total “hidden” sugar consumption. Thanks again – this was really helpful. Thanks for sharing that, Celine! I take chromium too. I’m so glad you’re feeling better. Not so sure that totally sugar-free life is even possible (at least nowadays). At least for many people, it is far too much to go totally sugar-free. But I totally love your ideas in terms of decreasing your sugar intake. There are endless possibilities and I think you covered some of the most important ones. Increasing your water intake and eating more fruits are the ones that do not need extra effort. If you don’t have fresh fruits, dry dried ones – just dry your own, since commercially dried fruits tend to have a lot of added sugar. The drying process takes a bit of time, but the investment is worth it.